Idris Kanu after signing for Posh. Photo: Joe Dent/theposh.com. He’s sampled life at Manchester United and West Ham United, but Idris Kanu is happy to be at Peterborough United. The 17 year-old is regarded as one of the hottest prospects in the country, hence a spot at the renowned Hammers Academy and the chance to play for the Old Trafford U18s for whom he scored twice on his debut. Idris Kanu speaks to the Posh press. 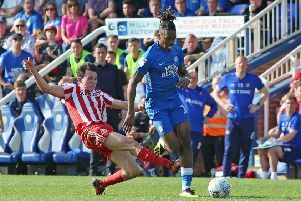 But it’s first-team football that Kanu craves which is why he moved to Aldershot of the National League as a 16 year-old and why he has now penned a three-year contract at the ABAX Stadium after Posh agreed an undisclosed fee with the Shots. “When you get the chance to play first-team football you take it,” Kanu stated. “And when you get the chance to join a club like Peterborough who give young players such a great platform for future success you take that as well. “Obviously I enjoyed my time at West Ham and at Manchester United. United are the biggest club in England so it was exciting to get the chance to play for them. “But I want to play men’s football so I’m happy to be at Peterborough where my aim is to get into the gaffer’s plans as quickly as possible. Kanu played 31 times for an Aldershot side that reached the National League play-offs last season, scoring three goals. Kanu is the Shots’ youngest-ever first-team player (16 years and 308 days).